The size of the header image in a Weebly page depends on the page layout you choose. 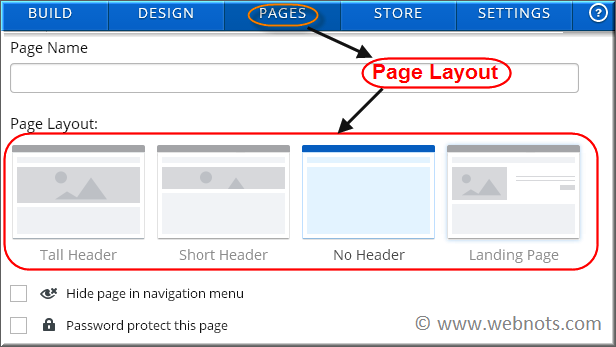 Following are the default page layouts available which can be selected either the time of page creation or by clicking the settings button on the header image. It is not necessary to have a same header image for all the pages of your site. Weebly offers a default function to add different header images to different pages of your site without modifying source code of the theme. This article explains the function in detail. Select any of the page layout options other than no header (No header page will not have any header section). Move your mouse over the header image and click on the “Edit Image” button. Weebly’s integrated image editor tool imageperfect will open. Click on the “Add Image” button to add your own header image. You should have a suitable image of the selected layout size for landing page, tall header or short header. Though most of the Weebly themes use the following default sizes for the header images, you can crop or expand the image to fit the space. Use the available options to edit your image if you want to merge your image with your site content and layout. This option helps to save the header image only to that particular page. In this way you can customize each page of your Weebly site with different header images. The last option is to save the image for selected pages. For example, if you uploaded an image in a landing page layout and choose this option then you will see a popup as shown like beside. The checkbox against all the landing pages of your site will be open for selection and all other pages will not be available for selection. You can choose the landing pages you wanted to add that header image. This method will be useful if you want to add a customize header image for same type of particular pages in group. If you are a pro user then you will have an option to add slideshow in the header. Different slideshows can be added to different pages in the same manner as explained above for an individual image. Page layout of an existing page with a header can be changed by clicking the settings icon available on the header image. If you have three different images each for landing page, short header and tall header then switching the page layout in this way is the easiest way to change the header image. That’s interesting as I’m experiencing the exact same problem with my tall header image – lots of frustrations! Would love to hear how to solve this problem or when Weebly will have remedied it. This size information doesn’t seem to apply to the new, responsive themes. Can you point me to information about those? It is more or less a similar process for responsive themes as well. After clicking on the “Edit Image” button, select the background image for your header and choose the required pages under “Save” button. The tall header does not work when replaced with one’s own picture. Weebly cuts off a lot of the picture and changes its size when it’s uploaded. Short headers adjust to fit the size of the screen; tall headers do not. There is an bug in Weebly’s code. I hope they fix it soon! I spent 8 frustrating hours today trying to preserve my Home Page’s tall header from the old theme and get it to work on the new one, including two calls to Weebly Support who were no help at all (so often the Support people know almost nothing!). I finally had to give up and use a short header, which is much less dramatic than the tall one was.